Unwanted, deceased or dead trees can be unsightly or even dangerous. That’s why we take your project very seriously. 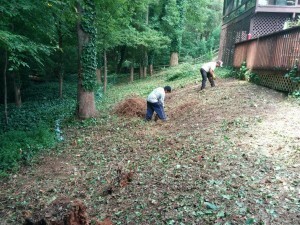 Tree removal is an important step to take in the overall maintenance of your lawn. Whether the excess trees on your lawn are eyesores or safety concerns, these unwanted trees can affect the curb appeal or perceived value of your home and even pose an imminent threat to the safety of your loved ones or your property. Don’t take the potentially-dangerous project of tree removal into your own hands. Let our fully insured and experienced experts handle the job with the property equipment and knowledge. Have old tree stumps that need to be grinded? Complete the job with stump grinding to ensure old trunks and roots aren’t an eyesore. 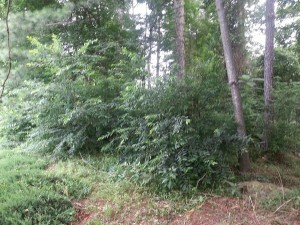 Have an unsightly area in your yard that’s full of brush and debris? Let our experts turn that overgrown space into a beautiful, functional area by clearing and adding professional landscaping. Bush hogging makes a dramatic difference in the appearance of your lawn, and we’ll get the job done quickly. Perhaps you’ve got storm debris on your lawn or even in your home. We understand the stress that comes with catastrophic events, and we offer hassle-free solutions for your storm debris removal needs. Hopefully, you’ll never need us for this service, but if you do, we’re here. 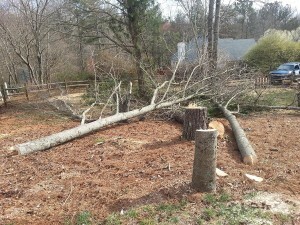 Visit our Project Gallery to see photos of recent Tree Removal projects.